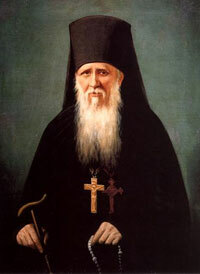 Our venerable father Ambrose of Optina (Russian: преподобный Амвросий Оптинский; properly Aleksandr Mikhaylovich Grenkov - Александр Михайлович Гренков, December 5, 1812, Bolshaya Lipovitsa settlement, Tambov guberniya—October 23, 1891) was a starets and a celibate schema priest (iyeroskhimonakh), canonized in 1988 by the Local Council of the Russian Orthodox Church. His feast day is celebrated on October 10, and the finding of his relics is commemorated on June 27. Aleksandr was born in the family of sexton Mikhail Fyodorovich Grenkov and Marfa Nikolayevna Grenkova. At the age of 12 Aleksandr entered the Tambov clerical school and later the Tambov theological seminary. Then he became a teacher in the Lipetsk clerical school and in 1839 entered the Vvedensk Monastery of the Optina Monastery in Kaluga guberniya. A few years later, he was ordained a hierodeacon, taking the name Ambrose in honor of Saint Ambrose of Milan. Two years later Ambrose became a celibate monk. When Fr. Macarius died in September of 1860, Ambrose became a superior of the monastery. Ambrose died in the Shamordinskaya cloister and was buried in the Optina desert. His relics were placed in the Vvedensk Monastery. This page was last edited on October 23, 2012, at 18:58. This page has been accessed 32,845 times.